Laser-based ARPES (Angle-Resolved Photo-Emission Spectroscopy) is a form of ARPES that uses a laser as an excitation source. Laser-based ARPES is operated with a narrow bandwidth UV laser source and offers several advantages over synchrotron radiation: A laser fits on a table (ok… a large table), and experiments can be performed at any time and independently of rare beam times in synchrotron facilities. 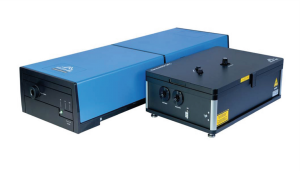 More technically speaking, a narrow-band UV laser offers a contantly high photon flux with an extremely high energy resolution of up to 0.1 meV. For comparison, the energy resolution of synchrotron radiation is typically in the range of 5 – 20 meV – and is therefore worse than the resolution of a good energy analyzer with about 1 meV. The photon energy of the laser source can be varied between 5.77 eV and 6.5 eV. 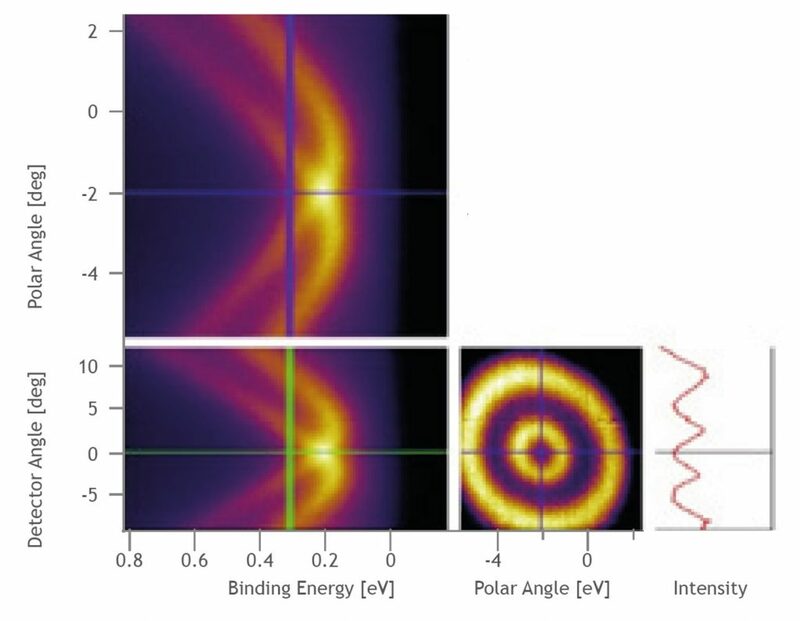 As these are low-energy photons, the Angle-Resolved Photo-Emission Spectroscopy benefits because the bulk sensitivity is significantly enhanced and the momentum resolution increased (compared to synchrotron radiation). Low-energy photons are sufficient to induce photoemission in many samples. However, it should be noted that due to the lower photon energy compared to synchrotron radiation, Laser-ARPES is particularly suitable for the measurement of electronic states close to the Fermi level. 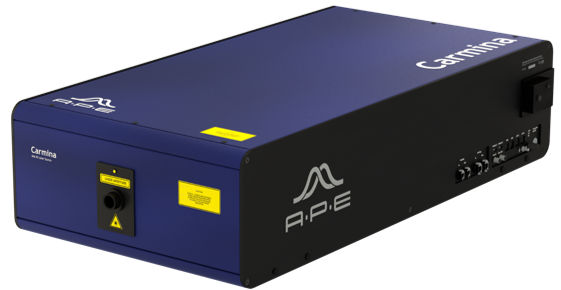 Tunable deep-UV pulses from 190 … 215 nm / 6.5 … 5.77 eV are available with APE’s ARPES-laser source, constiting of a HarmoniXX FHG in combination with Levante Emerald HP. The energy-tunable system provides high laser power in the range of several mW. Its brillant and monochromatic laser light is ideally suited for high-resolution ARPES (Angle-resolved Photoemission Spectroscopy) or ARUPS (Angle-resolved Ultraviolet Photoemission Spectroscopy). The following measurement were performed with APE’s 190 nm / 6.5 VUV system. 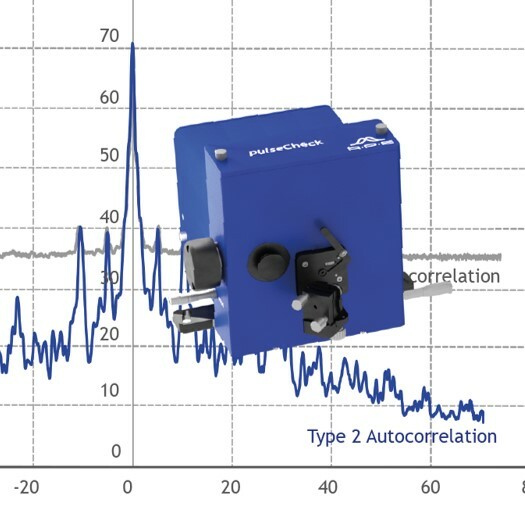 The ARPES measurement were taken on a SPECS GmbH system with a PHOIBOS 150 hemispherical analyzer and a 2D-CCD detector. 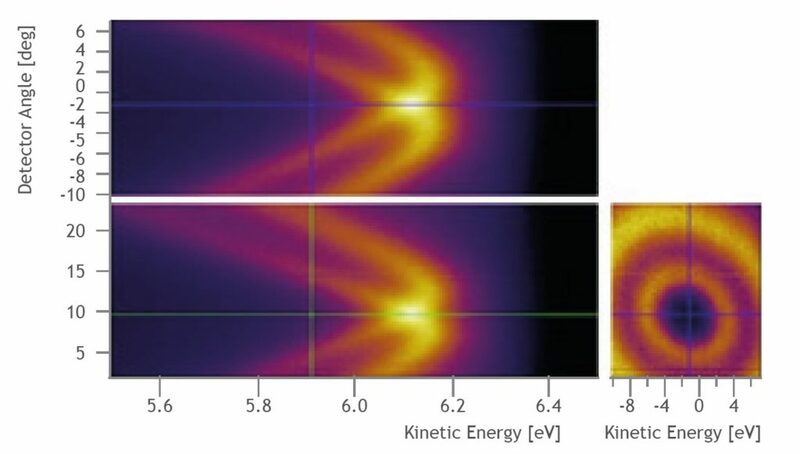 ARPES maps of graphene/Ir(111) sample measured with laser around normal emission geometry showing the Rashbasplit of graphene/Ir(111) surface state. 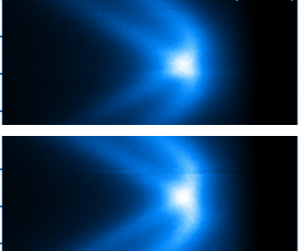 Two different entrance slits of the Electron Analyzer were used, resulting in different energy resolution (marked in the figure). Dependence on Temperature. 3D ARPES data sets for graphene/Ir(111) sample measured with laser (lens mode: WAM). Measurements were performed at T=300 K (RT, see image) and T=120 K (LT, not shown here). The HarmoniXX allows access to the wavelength range of 190 … 215 nm (6.5 … 5.77 eV) by mixing the THG with a fundamental wavelength to create the fourth harmonic. The harmonic pulses are of narrow bandwidth nature, enabling a high resolution across the entire tuning range. The generation of high power tunable UV radiation is based on a widely tunable picosecond OPO with computer controlled tuning, pumped by an industrial high power green laser and with subsequent frequency conversion to reach UV wavelengths below 200 nm. Paladin 532 – 20000 from Coherent Inc. is ideal for pumping the OPO. It is enabling a wide tuning range and high-average powers of the OPO output. Of course, other pump lasers can be incorporated into the setup as well.